Puducherry Chief Electoral Officer V Candavelou Friday said the present system of exercising franchise through Electronic Voting Machines in elections "is tamper-proof and most reliable." Presiding over the ninth "National Voters Day" celebrations here, he said "unnecessary and ugly propaganda was being made now against EVM-based voting. Such propaganda will not hold water and hence is untenable." 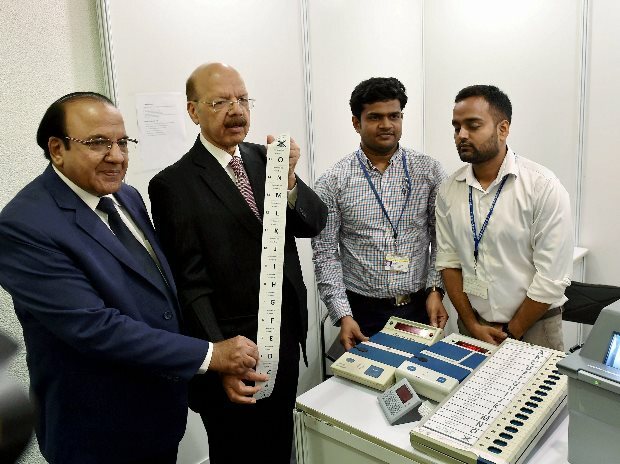 He said EVM-based voting is "tamper and failure-proof and has proved its reliability during the elections in the past." The Puducherry CEO said the Election Commission had also introduced the VVPAT (Voter Verifiable Paper Audit Trail) system and hence there was no room for any irregularity. "All propaganda against EVMs is absurd and false," he added. UPSC Member and former Puducherry Chief Secretary M Sathiavathy, who handed over voter identity cards to new voters at the event, suggested to the Election commission to introduce e-voting system which would enable migrant voters to exercise their franchise. She urged the new voters to ensure they mobilised those who had not registered their names in the voters list and help them register. "It is not only registration that is important. The registered voters should also exercise their franchise without fail during the polls," she said calling for separate queues at polling stations for senior citizens. She recalled her service in Puducherry as chief secretary and said the union territory had established good percentage of voting at the elections. She administered the pledge to the new voters and distributed prizes for winners of various competitions held in connection with National Voters Day. Chief Secretary Ashwani Kumar said democracy was very vibrant in the country adding all voters had the primary responsibility to vote without fail as they are makers of their destiny. A mobile awareness rally highlighting the features of EVM and VVPAT was also flagged off.